Eat in or take away at The Japanese Canteen and choose from a variety of authentic Japanese dishes such as sushi, noodles and rice dishes. Japanese Canteen serves fast food without the fat. Healthy tasty noodles and stir fries dished up hot and fast – great if you’re in a rush or just want a quick bite. McDonalds should take note - Japanese Canteen is where it’s at. 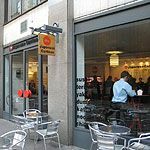 Another frantic lunchtime spot in Central London, Japanese Canteen beats heading to the same old chains you see on every street corner – but only just. 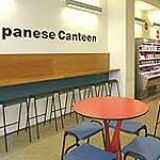 Among a sea of eateries vying for lunchtime trade, Japanese Canteen does well to stand out courtesy of its large frontage, comprised almost entirely of glass, and the vibrant red, black and white signage that gets its point across. Inside, there’s the usual display of easy to grab nibbles and drink on neat little shelves, a counter area that does well to deal with the crowds and a few simple tables and high stools in red and blue for those looking to eat in (although good luck nabbing one of these after 12pm). To be honest, though, you’re unlikely to even see the decor through the throngs of hungry office workers. The atmosphere at Japanese Canteen can be frantic to say the least – reflecting a similar scene to the hundreds of other lunchtime spots that pepper this area. The servers do a good job of keeping up with the queues though and you’re unlikely to be waiting too long, which is especially pertinent when you’ve only got an hour to spare at most. The service is a little abrupt at times but then the majority of people don’t seem to care too much – they just want to get in, grab food, stuff in face, leave. The food at Japanese Canteen is basic and well priced with a substantial dish costing around £5-£7 with extras like miso soup costing just £1.50. It’s certainly within the budgets of most Central London workers. The bento boxes seem to be popular and there’s also an array of noodle dishes, stir fires and ramens. A nice touch is you can choose the stock yourself – the spicy coconut with lemongrass adds a nice tang to the dish but still borders on being a little insipid. The salmon ramen (£5.95) does offer some quite generous chunks of salmon, though, which is good given it’s a premium ingredient. Mixed with vegetable and seaweed, it’s bulky enough that you’ll feel pleasantly full after a visit even if it won’t blow you away with Japanese flavours. Grab a can of Coke, an orange juice or a water – there’s not a great deal of choice drinks wise but enough to keep you well watered for lunch and prices are around £1-£2. Japanese Canteen offers a good choice for lunch when you’re fed up of the same old coffee shop sandwiches. Worth a visit at least once to make up your own mind. Hello, Japanese Canteen here, We have been in contact with Lisa210, the reviewer above, and have apologised for the misunderstanding. The fact is we have to charge 17.5% VAT on all cold food eaten in, as do Pret and Eat on all the sushi and sandwiches which their customers eat in. There is a sign on our fridges to explain this at the point of sale. Hot food is always vatable when eaten in or taken away, hence we don't charge extra. We understand this is confusing and just thought we would like to clear things up. 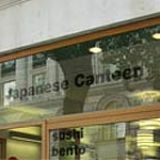 Japanese Canteen on High Holborn - I'm only giving this place 1 star because you can't put ZERO. They are rude, unhelpful and determined to make every visit unpleasant for their customers. I also suspect that their pricing is illegal because they don't declare its more expensive to Eat in and not Takeaway. Clearly they don't want people to stay because...I walk up and I put my stuff on the counter: Bored shopgirl: "Eat it or takeaway" Me: "Eat in, please" BS: "Its more expensive to eat in." Me: "How much more expensive?" BS: "Eighty or ninety" Me: "Eighty or ninety what? How much exactly? Pence? Pounds?" BS: "Very expensive, 90p" (I'm convinced she makes it up for each customer) Me: "That's fine, thank you. Do you not want people to Eat in? Then don't set up tables and chairs and you should have two prices printed...BS just shrugged. Isn't it illegal for a shop not to declare that the prices are different? I'm so disgusted by their attitude, BAD service and air of boredom. I know you get bad service in London but I'm surprised at this one because the food is good. Despite that, I'm going across the road to Pret from now on.